In old timey days, two bottles of cider was enough to make one completely pie-eyed. Well, in this recipe, it won’t even take one! 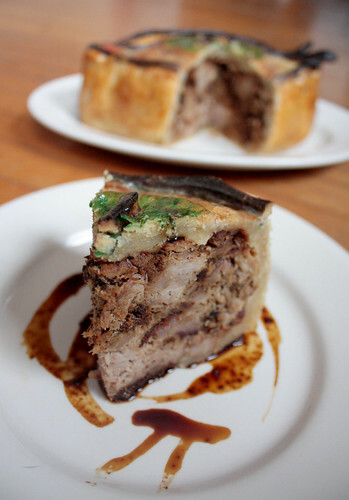 This delicious “pie-eyed” pastry is stuffed with “drunken” pulled pork which is slow roasted in hard apple cider. 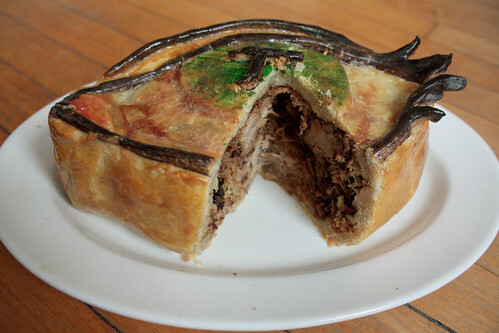 We’re upping the old timey ante by turning the classic British meat pie on its head, by substituting the traditional round shell for a tantalizing EYE shape, whose interior is porked out with our cider roasted meat. This Eye of Pi looks great and tastes even better, especially when garnished with the delicious hard cider au jus as a dipping sauce! 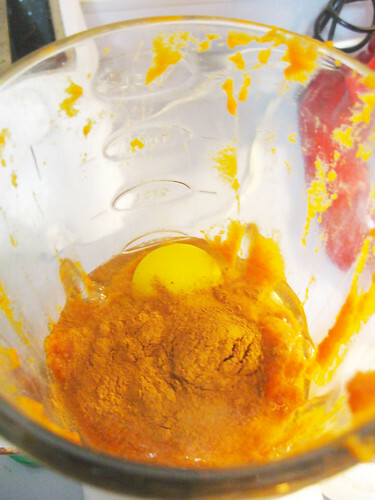 The recipe itself is quite simple, however the shape of the eye complicates the process quite a bit. 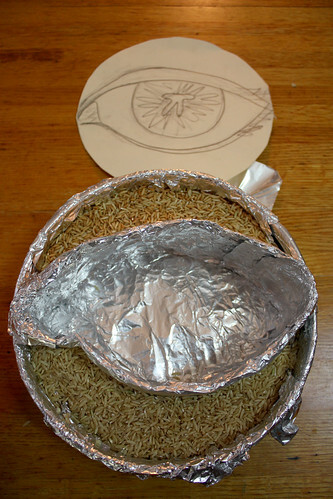 To get the eye shape, we created a custom mold using a spring form pan, aluminum foil and rice. 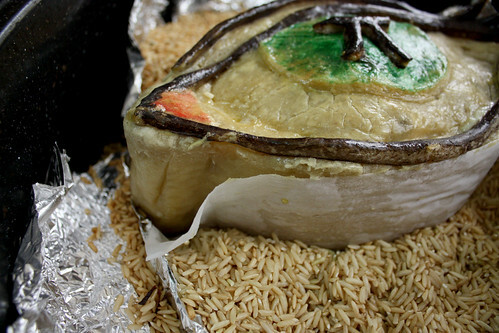 Mold made using a spring form pan, aluminum foil and rice based from a drawing above. Because classic British meat pies are tall and stand on their own, we needed a mold which would give stability during cooking, but then could be easily removed. Using a spring form pan, allowed us to easily remove the sides, discard the rice, which gave the aluminum walls of the mold stability and cut off the aluminum mold. Mold being removed half-way through baking process. After slow roasting the pulled pork in hard cider, we pulled it apart and compressed it into a tight ball to give us a proper filling texture. 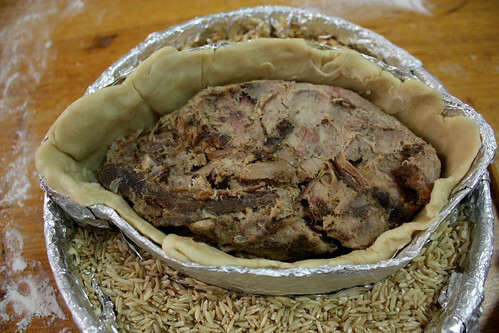 Compressed ball of pulled pork to be used for filling. 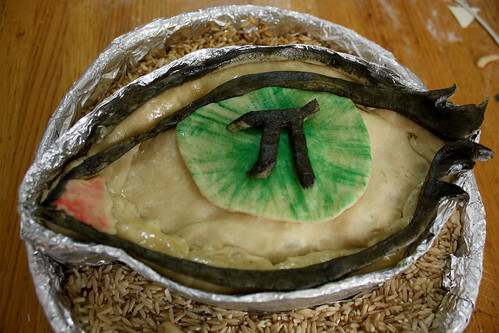 Once our mold and our meat filling was ready, we made a pastry dough and began construction of our eye pie. 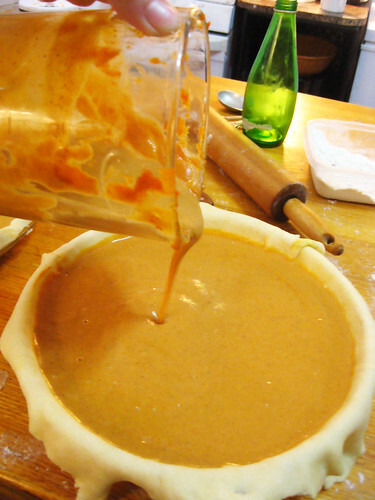 Because the pie needs to stand on its own, once cooked, the dough needs to be thick, about 1/4″. Once the dough topper was in place, we decorated with extra pieces of dough cut out to mimic the eye lashes, pupil, iris and tear duct. 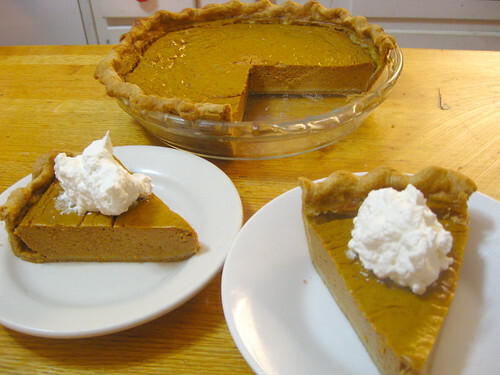 Food coloring was applied for added effect and the parts were laid on the pie to create the final touches. 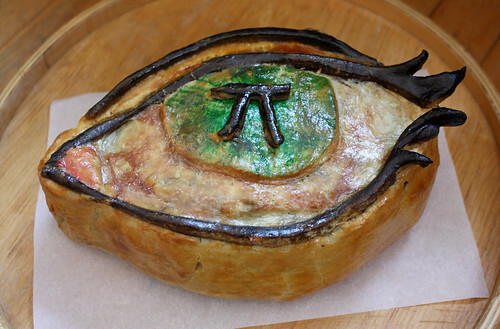 The pie was baked for an hour at 325 degrees, until it was strong enough to have the mold removed. Once this was done, it was brushed with egg yolk and put back in the oven for an additional 30-45 minutes at 400 degrees. It was sliced and served warm. Delicious. Here is the full recipe with detailed steps. Check out the slide show for more images. Don’t you always have scrap dough left over when making a pie? I do. I hate throwing anything away, so I’ll put it in the fridge, only to forget about it and have to throw it away later. Don’t do that either. Make a scrap pie! 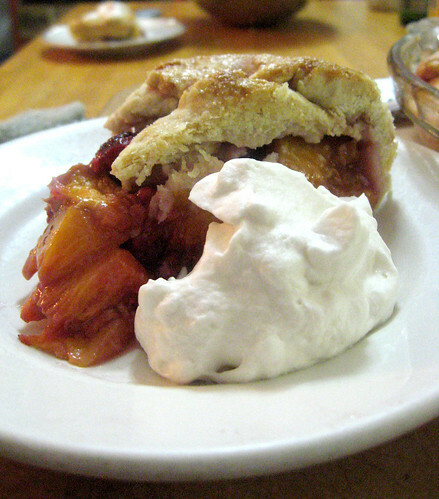 Just set aside some extra fruit to use as a pie filling. 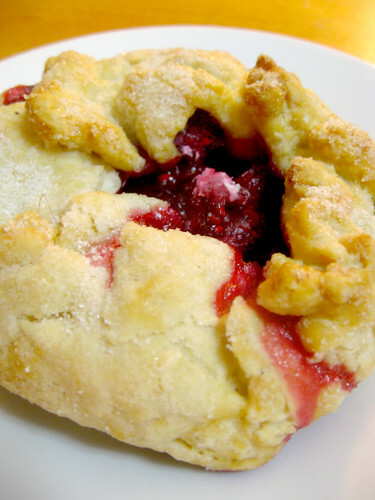 When you’re done with your other pies, combine all your scraps and roll them out. 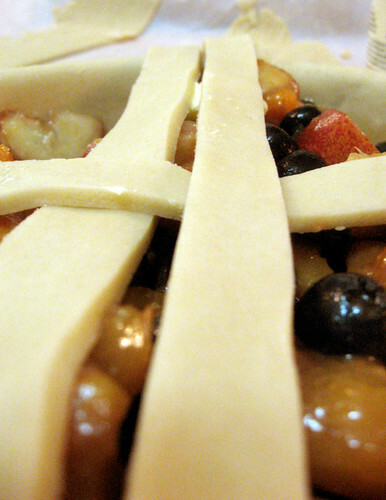 Mix your fruit filling (I like to do something a little different with it then the other pies so it is more special) and place in the center of the dough. 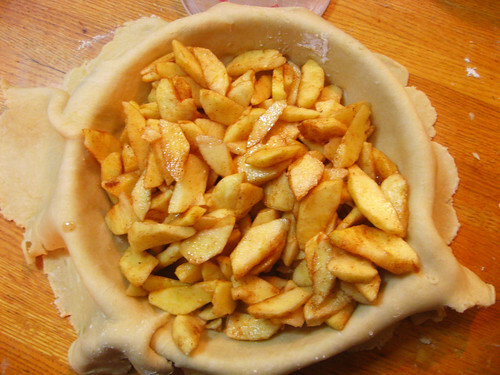 Fold the dough up and around the pie filling to form a little rustic tartlet. Brush with egg. milk, oil, or whatever you use and drizzle with sugar. Throw that bad boy into the oven with your other pies. Bam! A delicious little treat. Kids love them! 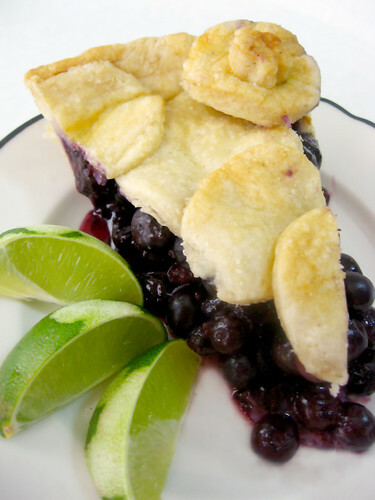 You don’t like blueberry pie? Why not. You’re grossed out by blue food? Well, get over yourself. You’re a jerk. Stop reading my blog. OK, Ok, Alright. You’re not a jerk. Different stroke for different folks. Its not our job to preach about pie, but for 99.9% of you, when I say blueberry pie is the best, I know, I’m preachin’ to the choir. To all you .1% out there, get over yourself. Ahh! There I go again. Don’t pay attention to me. Lets just get to the recipe. I guess technically this could be called Blueberry Citrus pie as the Pimms Cup liquor is a nondescript citrus flavor, but I liked the sound of blueberry lime pie. 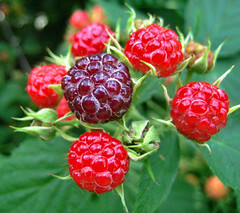 The lime zest and the Pimms helps set off the sweetness in the berries. If you don’t have Pimms, I suppose you can substitute an orange liqueur like Grand Marnier or sweetened lime juice. 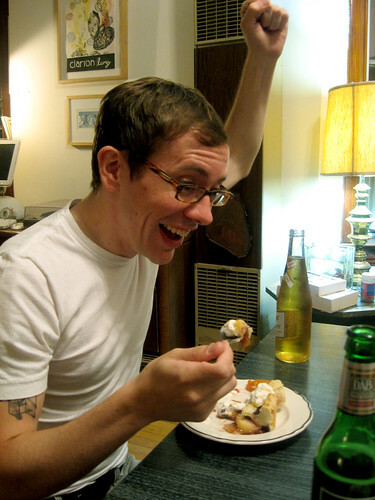 If you don’t drink, again, why are you reading this blog? Just kidding. I don’t know why I am so antagonistic today. I love all my readers. Truly. Try some orange extract. If you don’t have that, just add a bit more lime zest and perhaps some juice. 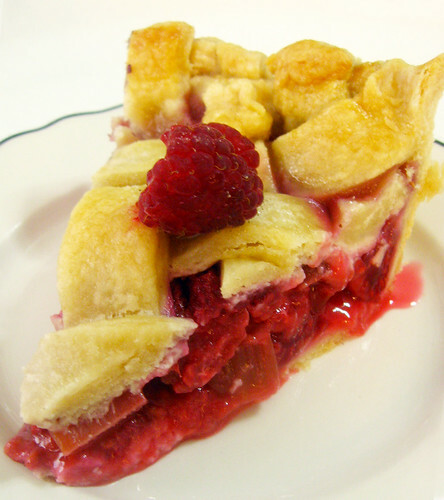 (pretty much the same as the Raspberry Rhubarb pie from the last post. 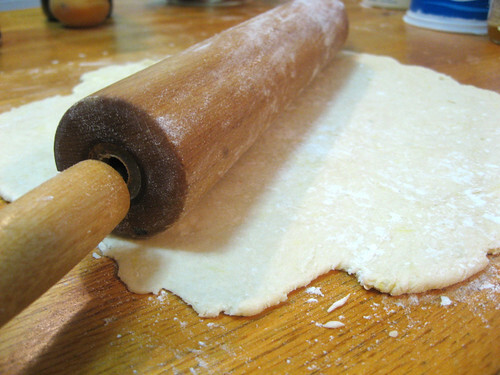 Roll out bottom pie dough. Place in a pie pan, and pre-bake for 10 minutes until golden brown. 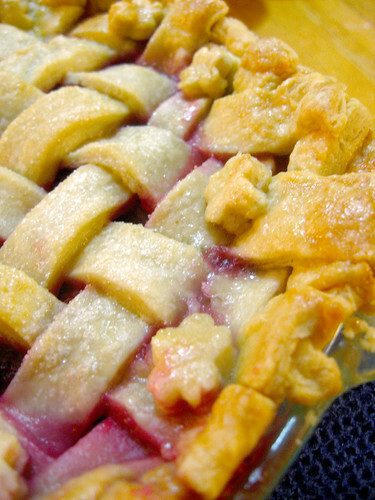 Mix filling and place in the pie crust. Put a top crust on in whatever decoration you choose. You can do a whole top or a lattice. 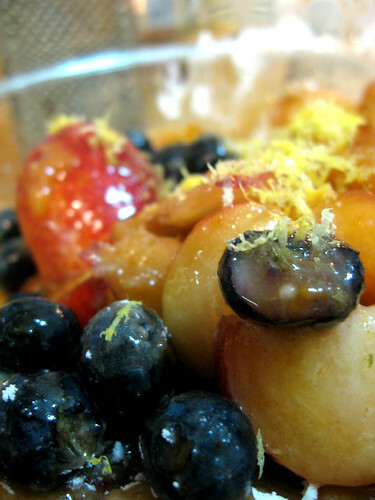 Above, I used 2 different sized juice glasses to cut out circles and overlap them as my topping. Fun! 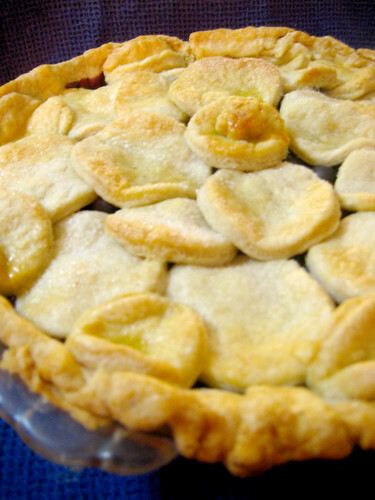 Brush pie with egg, milk, or oil, whichever you choose. Sprinkle the top with sugar. Bake at 375 for 45-60 minutes until crust is golden brown and filling is bubbly. 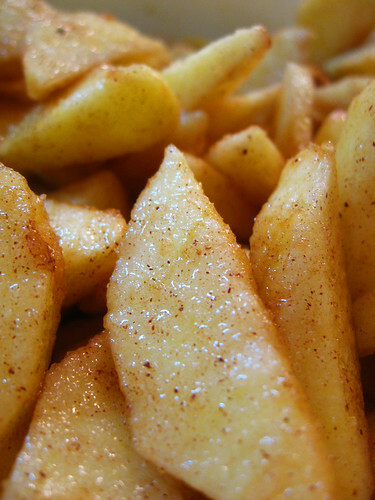 99.9% of you can now dig in. 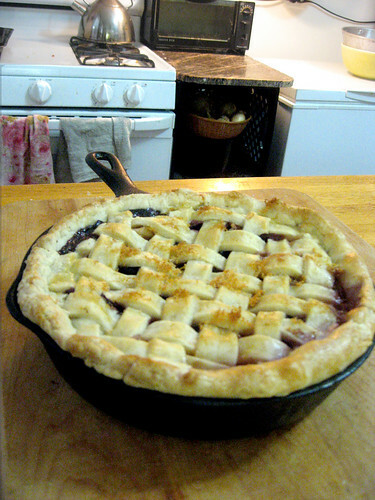 I’ve heard people say that making pies intimidates them because of the crust. Listen, its not rocket science. I mean, I can do it; anyone can do it. I guess it just takes the right recipe. There are tons out there for every different taste and diet. My mom prefers my Grandma’s recipe where the secret to its flakiness is lard (although she sometimes substitutes vegetable shortening). When Ira was a vegan, I relied on using his mother Janice’s oil crust recipe, which is animal friendly and simple with three ingredients: flour, oil and water. 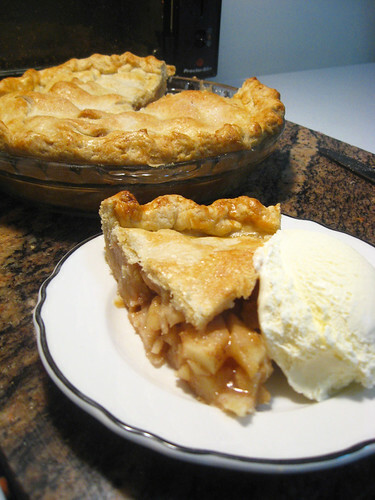 My favorite pie dough is a recipe I got out of Bon Appetit many years ago. 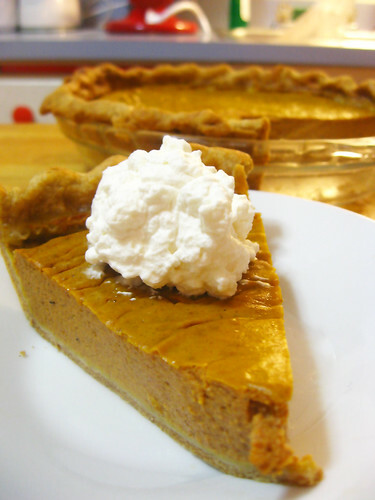 It’s a basic butter crust recipe, with an addition of a bit of sugar added to the dry ingredients and water spiked with just a splash of cider vinegar to give the dough a more tart flavor, which I think makes the crust so much more fun to eat. Of course, my Mom thinks I’m a cretin for abandoning the traditional family crust. 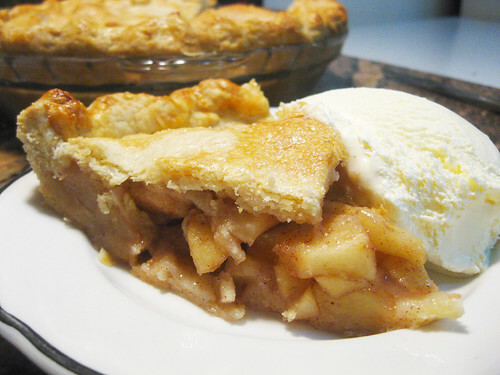 I know you want the complete recipes for the three pie crusts mentioned above. 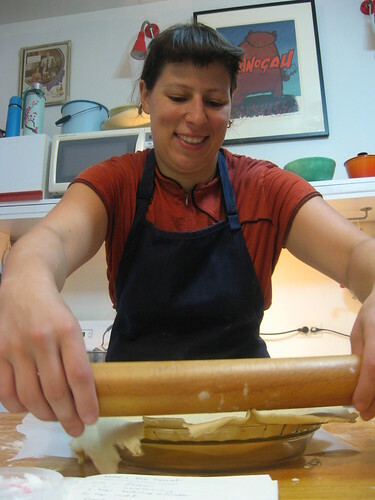 Here are four useful tips I hope you will find helpful when working your dough. 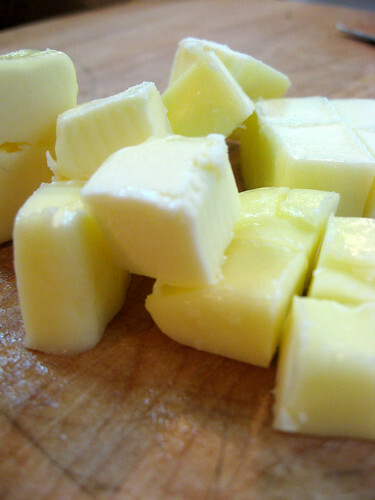 Use cold butter, either kept refrigerated until right before using, or placed in freezer for a short period before mixing into the dough.The hard cold butter will give a better texture to the dough, as you will have areas of chunky butter which, when baked, will make the crust more flaky. Use ice water to mix the dough. 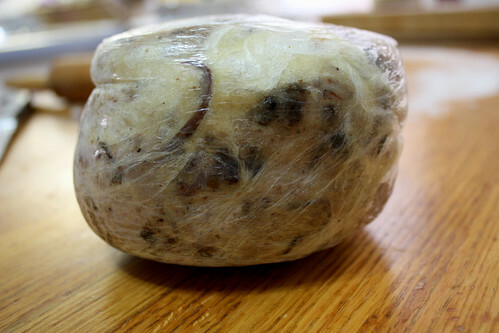 The cold helps bind the dough better and keeps the butter from melting when you are handling it. 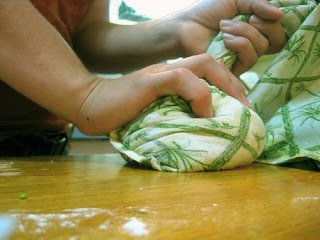 Use an old pillow case to knead your dough. This limits the handling, which will insure a more flaky crust as well as reduces the mess you have to clean up afterward. Don’t over work the dough, a quick knead is all you kneed. Obviously you’ll want to make sure the pillow case is clean and has all the lint picked out, because head grease and fuzzies aren’t the best accents to your pie dough. Roll the dough on a piece of parchment paper. You can spin the parchment around to easily roll the dough from different angles. 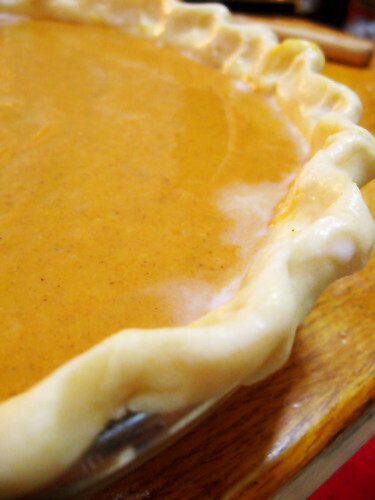 When moving the dough to the pie pan, I wrap the dough around the pin to give it support. 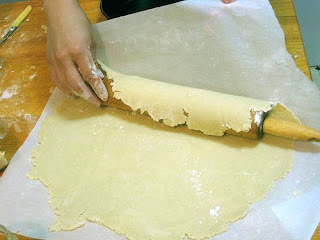 By rolling on parchment paper, you easily lift the dough onto the rolling pin so you can avoid breaking or tearing. Ahhh. Andrea…Shut up. No more tips. Lets make pies!